John, Jim and Shaun with captain Phil…………………………….. This week’s format was 2 scores on 1-6, 3 on 7-12 and 4 on 13-18. Thanks again to Liz Beaton for acting as starter. Excellent weather for the 47 players who made up the 12 teams. We have a rule for teams who are a player short – a ghost card is selected at random. 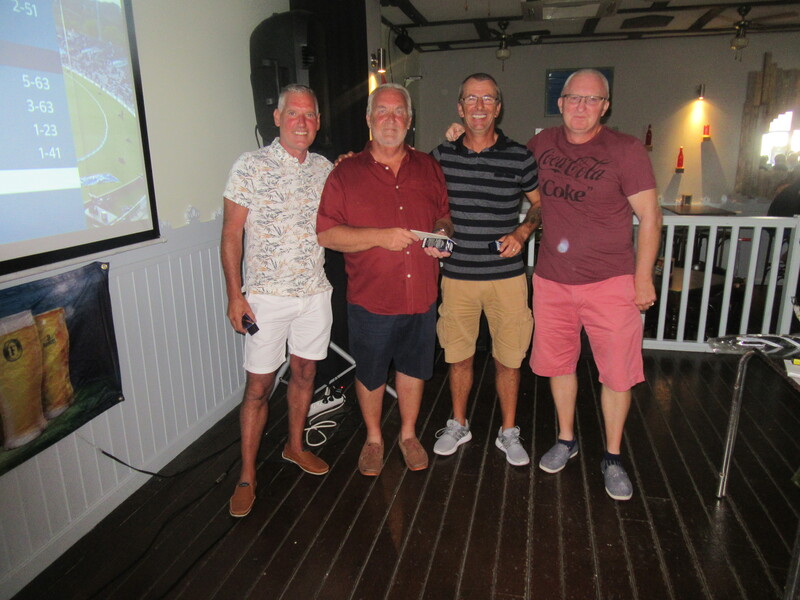 In this case it must have been a good ghost as the winners had the same score as the second team, and only won on back 9 countback, 64 to 65. John Eadie managed a first – the first time that I am aware that anyone holed out in two shots on the par 4 6th. Normally it is an achievement to even two putt on that green! Remember that green fees have changed from September, now 37 euros walking, 48 with a shared buggy. Next week’s competition is an individual stableford. And to fill space up……………………………………. Colin had his neck brace fitted years ago and since then he’s never looked back. Golf is not just a good walk ruined, it’s also the act of hitting things violently with a stick ruined. I went to a Pretenders concert. It turned out to be a tribute act. If you still don’t get it, ask a friend…………………….